If you’re ready to jump into your intuitive goodness, ditch the sidelines, and find out what psychic gifts YOU have, look no further! Below is an overview of all the psychic gifts and the signs or “symptoms” (as a lot of my students say) of each. 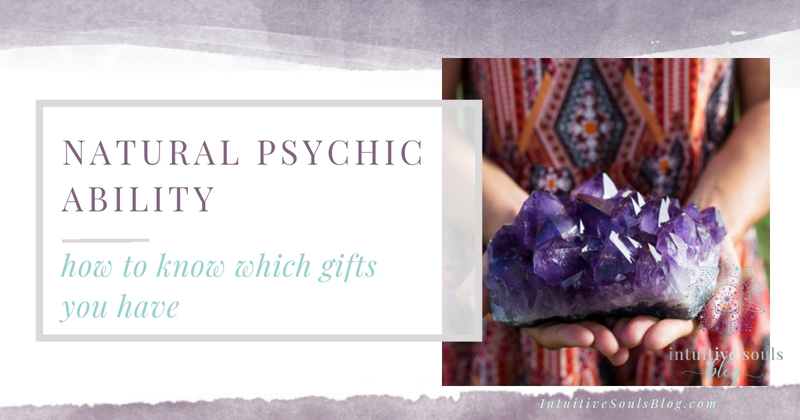 By the end of this post, you’ll know which natural psychic gifts you have and what your next steps are! 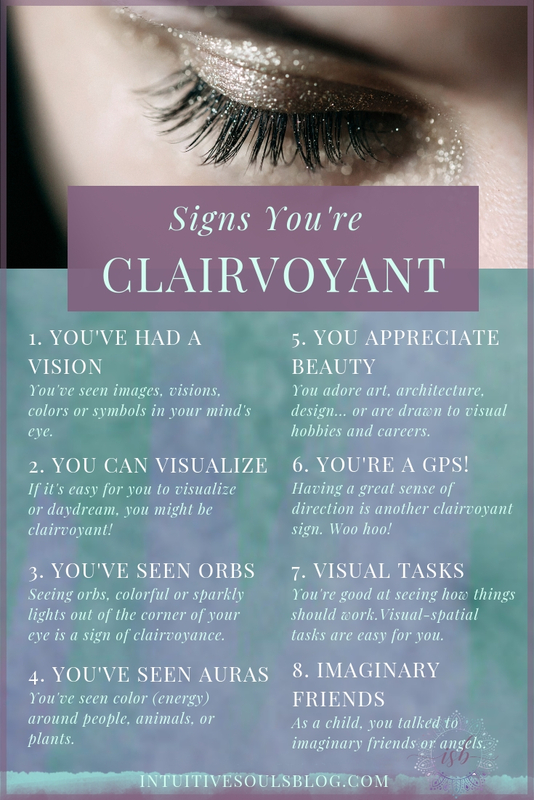 Clairvoyance – Psychic seeing in the form of visions, symbols, and pictures in your mind. Claircognizance – Intuitively knowing something without knowing HOW you know (i.e. there is no logic behind it, you just know for sure). In a minute, we’re going to discover which of these psychic abilities you have. 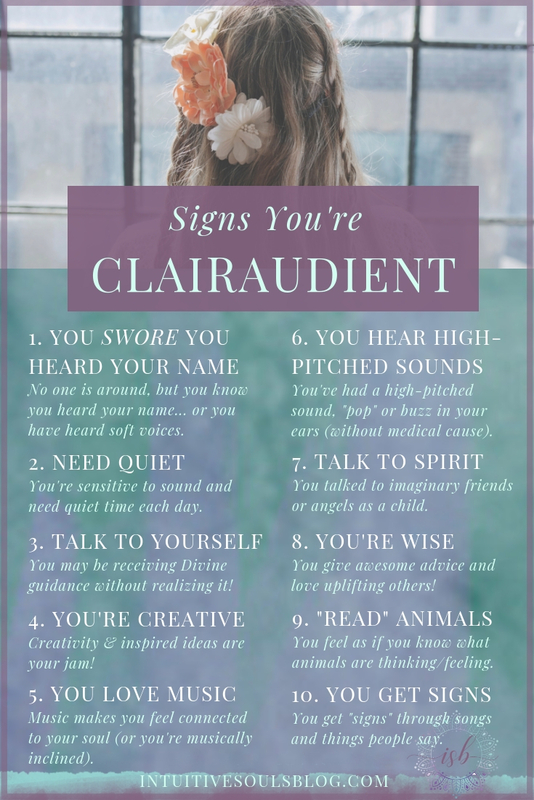 Don’t worry if you only resonate with ONE of the clairs. You can learn how to develop ALL of the intuitive abilities. I used to be weak in clairvoyance. But through practice, I was able to develop it as much as my other clairs. You’ll be able to do the same. You don’t have to have every sign for every clair. For example, I only have about half of the signs for clairvoyance. Just see what resonates, trust your gut and don’t overthink it. BTW, it’s normal for one or two of your psychic abilities to be stronger than the others. Okay, let’s dig in and see which natural psychic ability you have. So exciting! 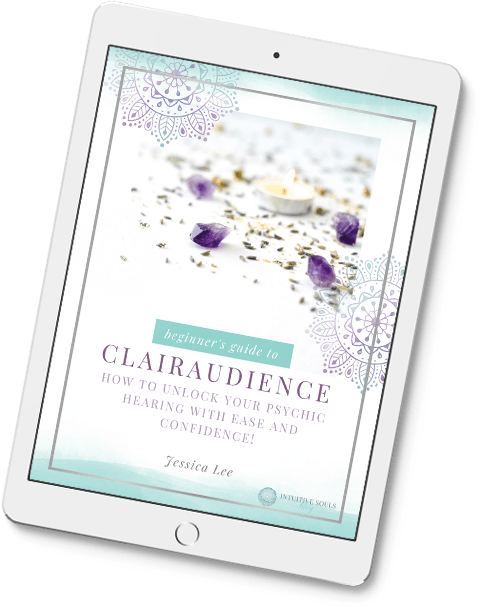 Clairvoyance is one of the most popular psychic gifts because it’s made a starring appearance in Hollywood movies and shows (like Psych and The Sixth Sense). But, even with its popularity, clairvoyance is a psychic ability that is often misrepresented. That means, you could be clairvoyant and not even know it! Believe me, it’s nothing like what you see in the movies. Clairvoyance is the ability to receive intuitive information in visions. Usually, you’ll see this visions in your head (known as the mind’s eye – in the third eye chakra area). Visions may look like movies playing in your head rather than dramatic projections that freeze time… and they can entail ALL sorts of messages. You may see numbers, colors, still pictures of people, places, or objects. The visions/images are often symbolic. For example, you may wonder why a pair of baby booties keeps flashing before your eyes and later find out that your bestie is pregnant. Remember: There’s no right or wrong way to be a clairvoyant (thankfully). You see movement, flashes or twinkles of light out of the corner of your eye. Your dreams are incredibly vivid (and they might come true sometimes). You have seen a Spirit in your mind’s eye or in physical form. As a child, you had imaginary friends or saw angels. You’ve had a psychic vision (duh!) or an image that “flashed” before your eyes (and the vision may have come true). You see other people’s auras (glowing light). It’s easy for you to visualize. You have a great sense of direction. Mazes, puzzles, and maps are easy for you to figure out. You can plan things in your head (the way a room should be decorated, your new landscaping…). When my daughter was 14, I pulled her out of school to homeschool her. Prior to that, she was really struggling, in part, because she’s extremely empathic and clairsentient. When someone is sad, angry, or ecstatic, she feels it. She is so sensitive to energy that school would leave her feeling exhausted, anxious, and overwhelmed. Can you relate to these feelings when you’re at work, school or out and about? Spoiler alert: If so, you’re probably clairsentient. Clairsentience refers to a clear feeling or sense about something. It’s the psychic ability to receive intuitive messages via feelings, emotions, or physical sensations. Being in large crowds drains you. Mega shoe sale at Macy’s… I think I’ll shop online! Tense situations leave you feeling really tense or anxious (more than the average person). You can’t shop at thrift stores or wear second-hand clothing. Organic products are your friend, as you may be sensitive to chemicals. Your friends think you have superpowers because you can always tell when something is wrong with them… even when they are trying to hide it! Watching the news and those animal commercials with Sara McLaughlin singing… YOU. CAN’T. EVEN. You actually go out of your way to avoid the news and reading the paper. You’ve physically felt other people’s intense emotions (like anger or fear). When you play music, you can feel it in your soul. You are super sensitive to your environment and can’t stand clutter or dirt. The Container Store is heaven on earth for you! You’ve sensed Spirits or loved ones in heaven around you. Clairaudience is another natural psychic ability. It means “clear hearing”, and it’s the ability to receive auditory intuitive messages. It’s like having psychic hearing and ears! If the thought of a spirit calling your name and making you spill your wine mid-bubble bath has you squirming, don’t worry! Clairaudience, like clairvoyance, is often misunderstood. Most of the time, clairaudience refers to inner hearing (although it can sometimes be external). You may “hear” from your Spirit Guides, Higher Self, or a Spirit (especially if you study mediumship). There is a LOT to this natural psychic ability. If you want to get the whole scoop, check out this post. It will help you understand clairaudience like a pro! Loud noise (like Grandpa’s TV volume on 50) bothers you or makes you cringe. You tend to hear things that others don’t. You’re an auditory learner. If given the option, you’ll listen to a book on Audible rather than read it on your Kindle. You have heard your name being called with no one else around (but not in a creepy way, I promise!). You’ve heard ringing or high pitched sounds in your ears (without a medical reason). You tend to talk to yourself (in your head) a lot. People call you for advice. You’re the “Dear Abby” of the family! As a child, you talked to imaginary friends. Each day, you NEED quiet time to feel sane and grounded. When you ask for signs, you receive them in songs and speech. If you’re always the person telling others to, “turn that down!”, check out these clairaudient exercises. My husband has the best example of claircognizance. He and some coworkers were driving down the highway, when he had the clear knowing that everyone in the vehicle HAD to put on their seatbelts. He relayed the message to his confused colleagues, only to be struck (at high speed) minutes later. There was no logical reason for him to KNOW they had to buckle up, but yet he did. The accident was bad and this claircognizant message may have saved his life! Claircognizance (clear knowing) is a sense of knowing… even when there’s no logical reason for you to “know” something. At least once, you’ve had a strong gut feeling that you couldn’t explain… that turned out to be right! You’ve woken up with an insightful answer to a problem. You have known something about someone (that they were lying or being phony) without any specific reason. You tend to analyze things or have an analytical job. Ideas or thoughts pop into your head, seemingly out of the blue. Your friends and family trust your gut feelings (because you’re usually right!). You’ve known what the outcome of a situation will be (a marriage won’t last, your friend will survive her diagnosis…). Mystery movies and novels don’t stump you. You’re a natural detective.